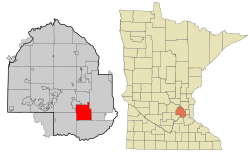 Edina is a city in Hennepin County, Minnesota, United States. Edina began as a small farming and milling community in the 1860s. The population was 47,941, as of 2010. Edina Public Schools is the public school district (ISD 273) that serves Edina. It enrolls approximately 8,500 K–12 students and is served by 1,139 teachers and support staff. Edina’s parkland and open space totals more than 1,550 acres . The Edina Park and Recreation Department oversees 44 parks, which include amenities such as baseball, football and soccer fields; softball diamonds; basketball and tennis courts; outdoor skating rinks; playground equipment for young children; and picnic shelters. The Department also maintains eight miles of scenic pathways for bicycling, walking, jogging, cross-country skiing and snowshoeing.